Stock #1283:14K WHITE GOLD RINGS... HUGE! 3- 1 carat Russian CZs (3 CTW)... Beautiful and hand-Crafted with top quality Jewelry workmanship!!!... 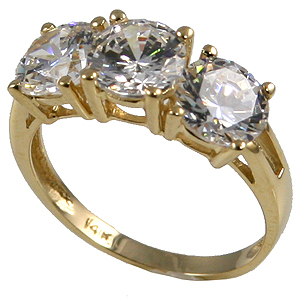 (Our Russian Cubic Zirconia are more precisely cut & polished from the finest quality CZs). Looks better and more brilliant than most diamonds!!! Also available in 14k Yellow Gold.